When I was in high school my PlayStation 2 was my prized possession. Around the time that the first Sony PlayStation came out, I reluctantly converted from a Nintendo partisan to a Sony supporter, in large part because Final Fantasy 7 was only available for on the PS. When the PS2 came out I was fully on board as the Nintendo GameCube and the original Xbox didn’t have any titles that particularly interested me. Also, the backwards compatibility features meant that I could keep many of my favorite games from the previous console generation in the rotation. AND it could play DVDs! Truly, I believed, we had arrived in The Future. 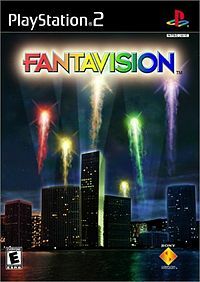 I don’t remember how I came to acquire a copy of Fantavision. I was one of the PS2’s early launch titles (it was originally a tech demo used to show off the new console’s impressive particle effects). I feel like maybe it came with the PS2 when I bought it? But I’m not certain. At the time I remember thinking I wouldn’t like it. 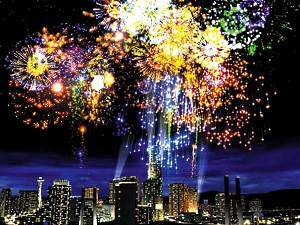 So all you do is match three fireworks to set them off? And chain together combos for a high score? Big whoop. I’d played a million match-three style games in my day. But I underestimated the appeal of a hypnotic gaming experience. I’m not always in the mood for a trippy gaming session. But sometimes it just feels good to zone out and become absorbed in lights and colors and sounds and vibrations from the PlayStation’s dual shock controller, to focus all of your awareness in your hands and allow them to walk over the screen, igniting the sky. Later on games like Rez and Chime would fill this same niche for me. But most of all, I found myself utterly charmed by the bizarre live action FMVs between levels. To this day I have no idea what is happening in this movies. But the kids are so darn cute and the retro-futuristic style looks awesome.